A tough collection of Exhaust Scrubber pollution control systems can be availed from us, which are manufactured by using optimum quality components and innovative methods. 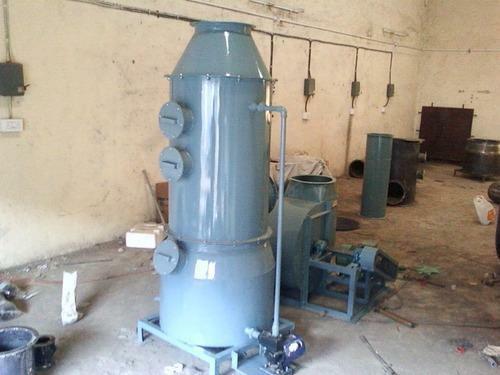 High efficiency, sturdy construction, compact designs and excellent performance arte the key features of these scrubbers that make its internationally accepted and demanded in world. These scrubbers are useful for various areas like Transport companies, Water treatment plants, Chemical plants and many more. Ever since our establishment in the year 1998, we are committed to offer the best designed products from best and premium quality raw components and material. Because of the robust construction, our wide range of products can aptly serve the requirements of diverse industries such as - Thermal Power Plants, Coal, Cement, Engineering Industries, Pharmaceuticals, Textiles, Sugar and Steel Plants. Setting new benchmarks of performance, we are one of the leading names, engaged in the manufacturing and exporting of world-class industrial air pollution control equipment & ventilation systems such as: Centrifugal Blowers, Axial Flow Fans, Dust Collectors, Air Curtains,Motorized Roof Exhaust Fans, Man coolers,Dust Collectors,Kitchen Ventilation systems,Cyclone Dust collectors and Air Pollution control equipments.